Published: Nov. 6, 2012, 6:28 p.m., Last updated: Nov. 7, 2012, 2:54 p.m. In 2010 the World Health Organisation (WHO) changed the HIV treatment guidelines for poor countries and recommended switching from stavudine (D4T) to tenofovir disoproxil fumarate (TDF) for all patients on first line treatment. 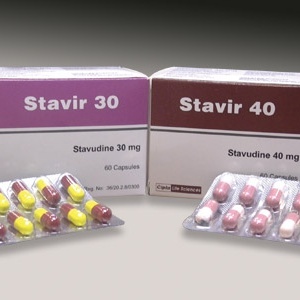 Stavudine (D4T) was previously one of three antiretroviral drugs (ARVs) recommended as first-line treatment but serious side effects, seen in many studies and treatment programmes, led to calls to use better, less toxic drugs. Source: Ternopil State Medical University. I would not go nor encourage any person living with HIV to participate in the study. TDF is more expensive than stavudine and the WHO guidelines do recognise the cost differences between the two drugs. Nevertheless the organisation still recommends that countries should plan to phase out the use of D4T.1 Subsequently South Africa was one of the few countries in Africa to change its antiretroviral treatment (ART) guidelines. Despite the cost differences between D4T and TDF, the government adopted a policy of phasing out D4T and replacing it with TDF, at least for patients starting treatment for the first time. This change brought hope for better treatment outcomes because of fewer side effects for patients and better adherence.2 This change also made it possible to have a preferred first line ART regimen of TDF, FTC and efavirenz (or nevirapine) that is in line with rich countries. A fixed dose combination (FDC) is when a number of different drugs are combined into one pill. South Africa's ART guidelines are clear that we will introduce FDCs for ART. The Minister of Health echoed this commitment in an announcement at the South African National AIDS Council meeting in Durban on 4 October 2012. Any FDCs that are considered have to take into account which drugs are on the first and second line regimens. D4T is taken twice a day, so it will not work in a one pill, once a day simplified first line strategy using FDCs. By contrast, the preferred first line regimen (if efavirenz is used instead of nevirapine) can be taken as one pill, once a day. Many people living with HIV in Africa continue to use D4T even in the face of life-threatening, painful and disfiguring side effects like lactic acidosis, peripheral neuropathy, and lipodostrophy (and these affect women and men living with HIV differently). According to the South African Department of Health about 40% of people on ART are still on D4T meaning we have not phased it out. D4T used to be prescribed at 40mg but was reduced to 30mg to reduce side-effects. But even at this reduced dose many patients cannot tolerate it. So do we really need a new study to look at a lower dose (20 mg) of D4T than the current one? Many people living with HIV around the world feel that we do not and that we should plan to phase out this drug completely as has been done in Europe and the United States. Nevertheless, the Bill and Melinda Gates Foundation is funding a new study looking at lower dose D4T compared to TDF in South Africa, Uganda and India. This begs the question: why only in developing countries and not in rich countries? This study is looking at whether 20mg will be enough to suppress the virus and it is planned to be a 48 to 96-weeks long study. But the most serious side effects of the drug are both dose and time dependent. Therefore many of its most serious side-effects may not occur until after the study is completed. Furthermore, any new low dose study in developing countries will encourage the continued use of D4T with the excuse of cost of the drug above the cost to the patients. Previously, a Wits University group of researchers planned a study looking at differences between D4T 20/30mg vs. D4T 30/40mg. This study was stopped by the study's Data Safety Monitoring Board because of the changes in the South African guidelines in 2010. It is not clear why this study was abandoned because of the guideline changes yet the more recent one is planned. The guidelines set the standard of care, so what will another study looking at D4T 20mg prove that we do not already know? The WHO says phase out D4T. So do our guidelines. The Department of Health is phasing out D4T and no new patients are started on D4T. The patients who will be given D4T in this trial will be given substandard care because if they were to go to a clinic next to the trial site they would be given a better drug with fewer side effects. People living with HIV met with the team planning this study and we were not convinced that a person living with HIV should be encouraged to participate in this study while they can get a better service outside of the study. I would not go nor encourage any person living with HIV to participate in the study. I am not arguing that people who are currently doing well on D4T should stop immediately but those who are not yet exposed to the drug should not be put at risk. During the TDF stock-outs between February to June a number of people living with HIV had to start D4T again for longer than a month without any plans to screen which patients had a history of side effects. This is worrying and so long as the Department of Health still has D4T in the tender this kind of thing will continue to happen. I write this as a person living with HIV who does not wish to take d4T and will not encourage any of my family members and comrades to participate in any study that will provide substandard care. People living with HIV are critical partners from formulation to implementation of research studies and country programme implementation guidelines and our concerns should not be ignored. Rather than another D4T trial, we need a timeframe, from the Department of Health, for totally phasing out this drug. Dubula is the General Secretary of the Treatment Action Campaign.